Earn 4 SB per $ when you buy Champs Sports gift cards at MyGiftCardsPlus. 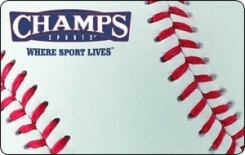 Champs Sports is a leading mall-based athletic retailer with 565 stores. Its stores offer a product mix comprised of athletic footwear, apparel and accessories for a wide variety of sports, fitness and lifestyle activities. Each Champs Sports store is designed to provide an in-depth array of products, one-on-one customer service and a sales environment that reflects the lifestyle of its target market – 12-to-25 year old consumers who reside in suburban communities.